In the developer world, there is an endless argument for which approach is the best platform for mobile application development. As mobile software and website development are inevitable for companies, it is important to be informed about the opportunities and obstacles of choosing either a hybrid application or native application development. It is also significant to fully understand how both hybrid and native mobile application platforms function and how to distinguish between these two applications. When we think about an app, usually native app hit the mind. A native application (native app) is developed specifically for a mobile operating system. They can only act together with and take advantage of operating system features and other software that is installed on the same platform. Native apps can take advantage of the latest technology available on mobile devices such as a global positioning system (GPS) and camera, this can be considered as an advantage for native apps over hybrid apps. Native user interface allows users to quickly learn the app also will be having better user experience. Native apps look and perform the best. In short, we can say that native apps are exactly that, native to the user’s operating system and hence created accordingly. 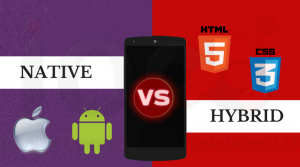 The hybrid application combines both native and web application (web applications are commonly used for multiple platforms and not installed locally but made available over the Internet through a browser). Hybrid mobile apps are like the usual apps that commonly find on everyone’s phone. They can be downloaded from the app stores and install on the device. With these apps you can take photos, play games, get around your friends through social media and much more. In native app ,the script is written only for one platform and that cannot be utilized for a different platform so,they are platform-specific. In hybrid app, the code is written just once and then compiled into platform-specific apps. In native app, launching of new apps is a time-consuming task. In hybrid app, it can be launched faster. Native app building requires continuous investment, each time when an app is developed, tested and maintained. Native turns out to be expensive to hire skill-based, platform specific resources. In hybrid app, the user experience is not as great as native technology. It becomes difficult to achieve good quality and performance, when there is a need for high performance. In native app, the Codebase for all platforms is same so ,cost effective and simple. In hybrid app, Maintenance is more complex if the app is on multiple platforms, will have to fix bugs on all platforms resulting in higher cost and time. The dominance of native mobile app development over a hybrid approach is likely to continue with the growth of mobile application development. Choosing the right approach is important in app development. From our expertise, the user experience is the key to the triumph of a mobile app. A good user experience, that none of your vertical competitors can provide, have the potential to lure away the user from their existing platforms. So, we are saying User experience is the thing that all matters, it can make or break the success of the app. Preferably, App development approach must be in accordance with the time and budget frame. Hence, It is the performance of app, user experience and other key factors that matter the most for businesses to grow with Apps.